∙ Surfboard rack hand-crafted in sustainably sourced FSC Pine. ∙ Available to hold 4 – 8 surfboards. ∙ Padded supporting rods with securing straps included. ∙ One size fits all surfboards, long or short. ∙ Simple 4 piece assembly, pre varnished. 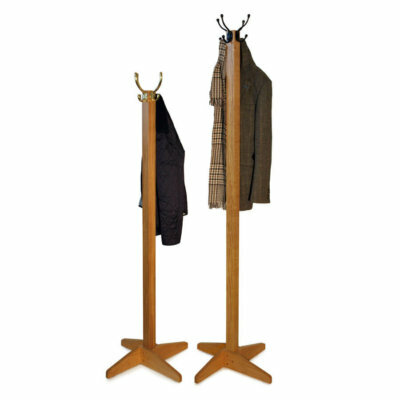 Short board or long, our free standing wooden Surfboard Racks will keep your quiver under control. Designed and hand-crafted with care, here at the Boot & Saw workshop in Cornwall, our Surf Racks are available for up to 8 surfboards. Handmade to last using only the best quality timber from managed forests, the supporting rods are padded to protect your boards and colourful clip straps hold them safely in place. When the surf looks good, simply unclip your favourite stick and head out. 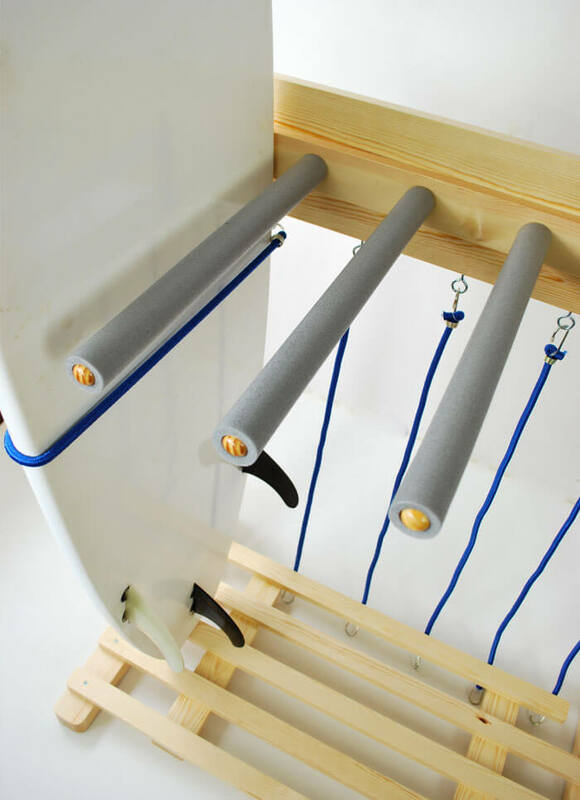 As our Surfboard Racks are free standing, they’re easier to move about, and there’s no need to make a mess drilling holes in the wall. The whole thing goes together in minutes with just a few screws and the feet are adjustable to stop any wobble. Boot & Saw Surfboard Racks are designed and hand crafted in house using sustainably sourced Pine from managed forests. We only use premium grade Redwood Pine which is an attractive wood with as few knots as possible, making it both sturdy and durable. We personally select each timber board ourselves to make sure your rack is of the best possible quality. Supplied semi assembled and ready varnished using durable yacht varnish, we’ve sent our Surf Racks all over the world. The 4 main sections screw together in minutes with the supplied fixtures. Then just add surfboards, clipping them in with the supplied straps. Our Surfboard Racks are available in a range of sizes for 4 – 8 Boards but we welcome custom requests if you have something a little unusual to store or need a custom sized rack. If you’re after something truly special we can even make your surfboard rack in solid Oak. For any custom requests just drop us a line. Absolutely brilliant,so easy to put together, so well made. Thank you for both the 4 board rack and the 6 board rack. Its a shame I couldn’t give a 10 as these racks are perfect for our surf shop. When they arrived I was thinking IKEA going to take hours. I have never put together anything as well in a short space of time. Well built with a lot of thought.Thank you guys. Fantastic product. Excellent quality and easy to assemble. Was packed very robustly and communication with supplier was excellent. Highly recommend the surf rack, thank you! Fantastic product and excellent customer service. Went above and beyond to meet expectations. Arrived to Guernsey this week and it’s beautiful. Easy to put together and does the job perfectly. Thanks so much. The surfboard rack arrived a few weeks ago and is holding my boards up perfectly in the hallway. Easy to put together (although I would recommend an electric screwdriver) and looks great. The service was also excellent. Thanks a lot Tristan! Really great product very well made. It goes together easily, looks great and functions great. Thank you Tristan. A rare company that offers quality products and quality customer service. A joy to deal with from start to finish. The product is beautifully crafted and easy to assemble. My personal comment would be that bungy hooks are easier to use than straps to hold the boards. My boards fit nicely. Enough space for the board bags too. Excellent product and customer service. Had my doubts buying online, sight unseen so to speak but got the surfboard rack, very happy with it, easy to put together, great looking. Prefect really. No complaints at all. Seller was available during the whole process of receiving the surf rack. He kept me in the loop and addressed any questions that I had. The rack was delivered and I put it together in about 30 minutes. Stable, good looking, and perfect for my garage! Great work! Very well made rack and straightforward to put together- really pleased. Excellent communication from Tristan too. Highly recommend. This is a beautifully made surf rack with very well considered details and it is solidly built. It looks fantastic in our hallway holding 8 boards. It was really easy for me to put together on my own and I couldn’t be more pleased with it. Tristan personally answered my initial queries and promptly followed up on my order which arrived exactly on time. 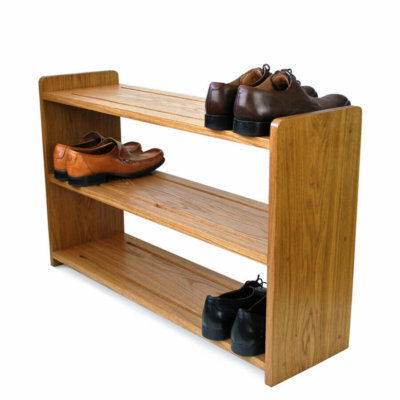 This is an excellently designed and crafted piece of furniture and a top class service. Thank you very much Tristan. Surf racks are great! built very sturdy and easy to assemble. Love our surf rack from this company, Thank you. The surf rack arrived yesterday, and its currently sitting in our garage holding our boards. It is absolutely awesome. Thank you so much. Just a short note to say the surfboard rack arrived safely yesterday. Very impressed with the whole thing, particularly the excellent fit of all components – as a detailer of structural steel I appreciate these things don’t happen by accident! Many thanks for everything.